Leontius (died 488) was of Syrian origin, coming from Dalisandus. Under Zeno, he became magister militum per Thracias (Commander-in-chief of the Imperial army in Thrace). In 484AD, the Roman general Illus broke off his relationship with emperor Zeno. 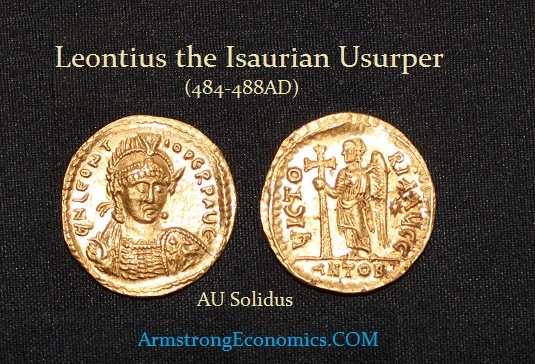 The Emperor sent Leontius with an army against Illus, but Illus managed to persuade Leontius to join him. Zeno was considered a barbarian despite the fact he had been selected by Emperor Leo I to marry his daughter. Illus, who also was an Isaurian, decided not to take the throne for himself given the prejudice against his origin being the same as Zeno. Leontius was a patrician and this Illus raise him to the throne. Leontius’s coronation took place in Tarsus on July 19th, 484AD based upon the advice of some astrologers. He was coronated by the empress dowager Verina, who had been a prisoner of Illus. She then sent a letter to the Governors of the Diocese of the East and of the Diocese of Egypt suggesting they accept the usurper as Emperor. Leontius was recognized in Antioch, where he entered July 27th, 484AD, and in some other places. He minted some coinage before facing Zeno. Zeno’s army, composed of Roman and Ostrogothic troops and defeated Leontius near Antioch on August 8th, 484AD. Illus and Leontius were forced to take refuge inside the fortress of Papurius, where the insurgents held out for four years. In 488AD the fortress fell through treachery and Leontius was beheaded and his head was sent to Zeno. Note: The coin illustrated here is the only example in private hands. Three others exist but are all in museums. This is by far the finest known surviving coin. Considering that Leontius entered Antioch on July 27th, 484AD, and then was defeated by Zeno’s army near Antioch on August 8th, 484AD, it is no wonder that this is second only to the Saturninus specimen of which two exist, with again only one in private hands.